Welcome recent developments have included revised SQUIRE guidance on what should be included in QI reports3 and the TIDieR guidance4 on what should be included in intervention descriptions. Yet reporting of QI interventions continues to be sub-optimal. A qualitative study is being carried out at the University of Leicester to examine the reasons why reporting in QI has been sub-optimal in the surgical literature. Emma Jones (under the supervision of Professors Mary Dixon-Woods and Graham Martin) will interview a variety of stakeholders to explore their views on what is most difficult about describing QI interventions and what should be done to improve this. 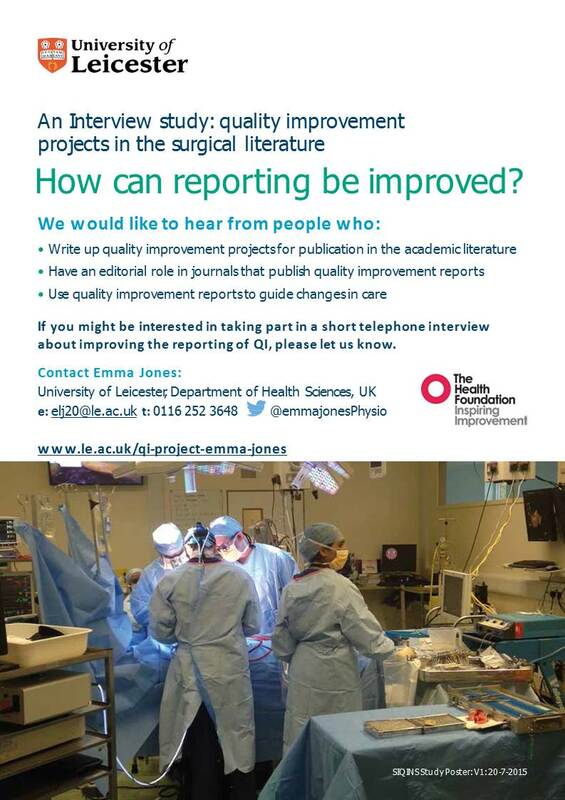 If you might be interested in taking part in a short telephone interview about improving the reporting of QI, please let her know. 1. Øvretveit J, Leviton L, Parry G. Increasing the generalisability of improvement research with an improvement replication programme. BMJ Qual Saf. 2011;20(Suppl 1):i87–91. 2. Schulz, R; Czaja, S; McKay, J; Ory, M; Belle S. NIH Public AccessIntervention Taxonomy (ITAX): Describing Essential Features of Interventions (HMC). Am J Heal Behav. 2010;34(6):811–21. 4. Hoffmann TC, Glasziou PP, Barbour V, Macdonald H. Better reporting of interventions? : template for intervention description and replication ( TIDieR ) checklist and guide. BMJ. 2014;1687(March):1–13.